Our team is now full- thank you! Jackson Jones and Steph Peters, from the Today’s Q106 Morning Show will lead your team of do-gooders. We’ll spend the day together, helping make a home warmer, safer, or drier for one of our neighbors in the Madison area who otherwise couldn’t afford to do it. Our day will begin at 8:00am on Saturday April 27th. A free lunch, water, and soft drinks will be provided. We should finish by 3:00pm. We will email the address of the home that we’ll be working on several days before the event. 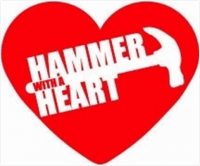 Learn more about Hammer With A Heart here.